In the new generation of the radical 911, the connection between everyday driving and the racetrack is even more intense. At the heart of the latest enhancement beats a four-litre flat engine. 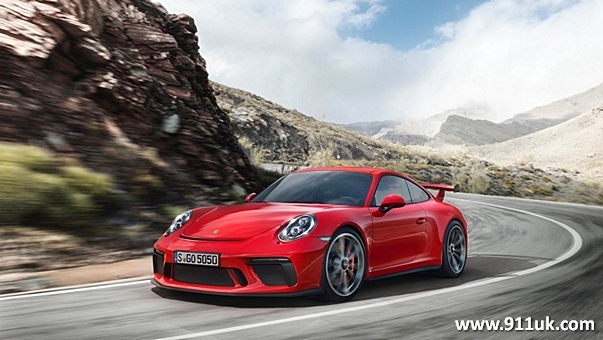 The extremely high-revving naturally aspirated engine with 368 kW (500 hp; Fuel consumption combined 12.7–12.9 l/100 km; CO2 emissions 288–290 g/km) remains virtually unchanged from the thoroughbred 911 GT3 Cup racing car. The redesigned chassis with rear-axle steering and the systematic lightweight construction are specifically tuned to convert the engine power into superior driving dynamics. Developed on the same test track and manufactured on the same production line as the racing cars, Porsche’s motorsport technology has once again been incorporated into a road-approved sportscar. 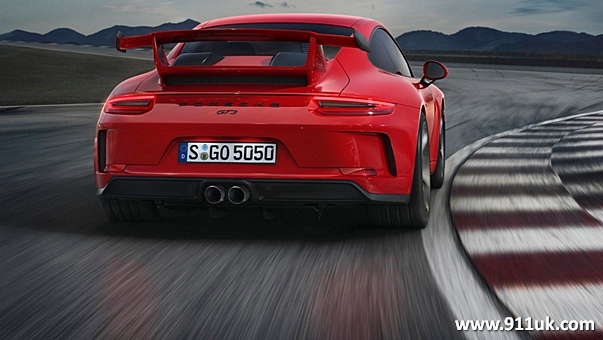 The majority of Porsche GT drivers also like to take their sportscars for a spin on the racetrack, which is where the new 911 GT3 really comes into its own thanks to its weight-to-power ratio of 3.88 kg/kW (2.86 kg/hp). With seven-speed double-clutch transmission (PDK) as standard, which has been specifically tuned for use in the GT, the two-seater weighs in at 1,430 kg with a full fuel tank and can accelerate from 0 to 100 km/h in 3.4 seconds. Its boasts a top speed of 318 km/h. 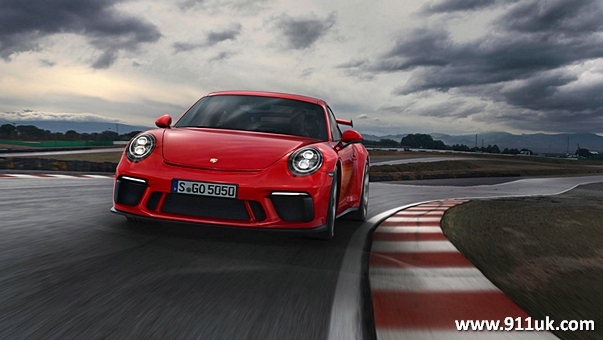 For proponents of pure unadulterated driving, Porsche also offers the 911 GT3 with a six-speed sports manual gearbox. 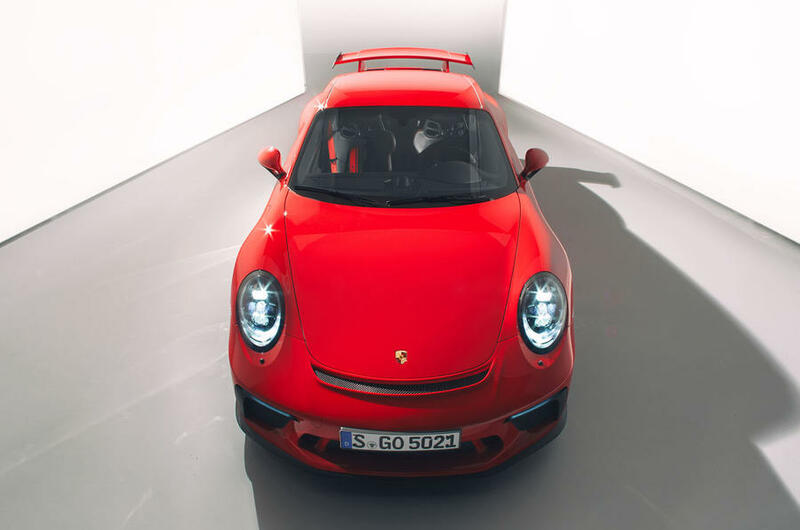 This allows the high-performance 911 to sprint from 0 to 100 km/h in 3.9 seconds and reach a top speed of 320 km/h. The chassis of the new 911 GT3 benefits from Porsche’s motor racing experience and its tuning has been reworked for even better driving dynamics. 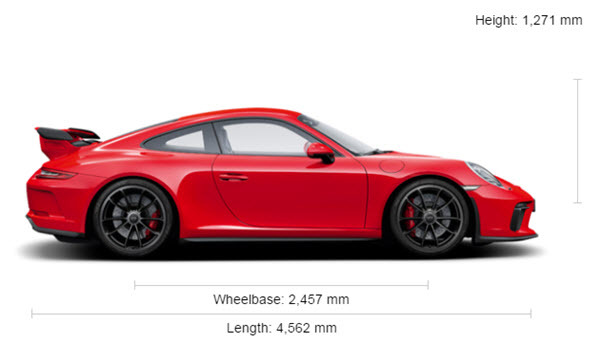 The new two-seater sits around 25 mm lower than the 911 Carrera S. In addition to the further refined basic design, the chassis also boasts superior handling characteristics, thanks in large part to the active rear-axle steering. Depending on the speed, it steers either in the opposite or the same direction as the front wheels, thereby improving the vehicle’s agility and stability. The dynamic engine mounts and the rear differential lock also boost the car’s driving dynamics. 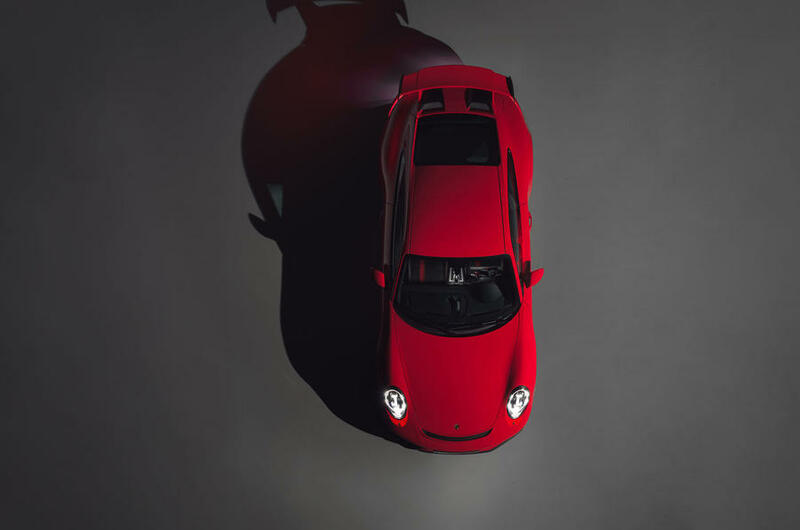 When it comes to its appearance, the 911 GT3 leaves little doubt as to its purpose. The dominant carbon rear wing emphasises the fact that the sportscar’s form is determined by aerodynamics. The lightweight front end and front spoiler have been optimised for an even better airflow. The aerodynamic enhancement is also evident on the lightweight rear end with exhaust air openings and on the new diffusor. 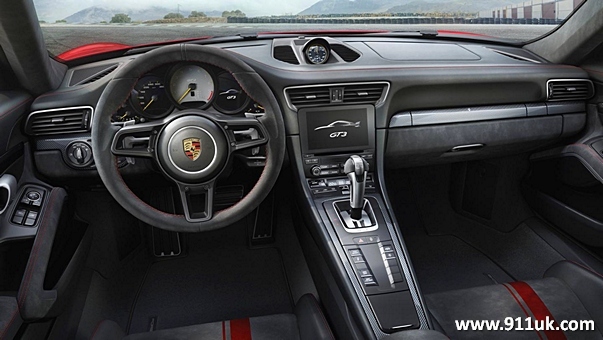 The interior of the new high-performance sportscar is tailored to the 911 GT3 driving experience. The GT sports steering wheel with a diameter of 360 mm originates from the 918 Spyder. Both the driver and passenger experience the dynamics in Porsche Sports seats Plus with enhanced seat side bolsters and mechanical fore/aft adjustment. The seat height and backrests are adjusted electronically. 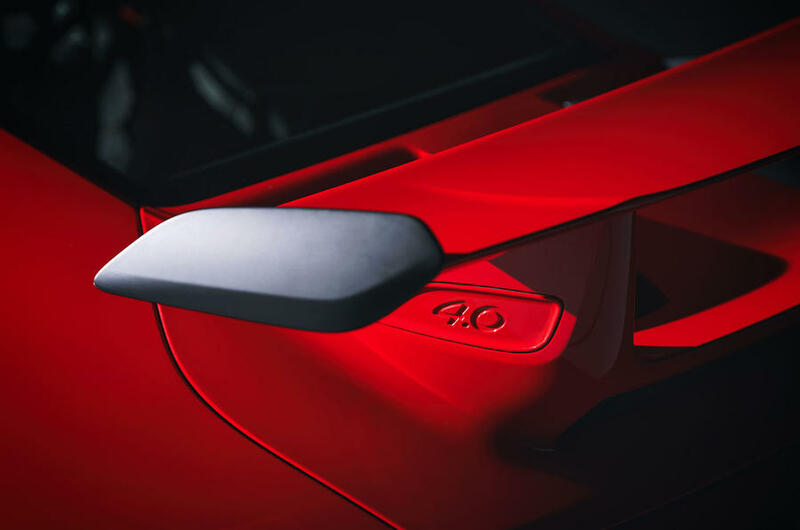 As the 911 GT3 is traditionally a two-seater, the seat pans in the rear are covered. 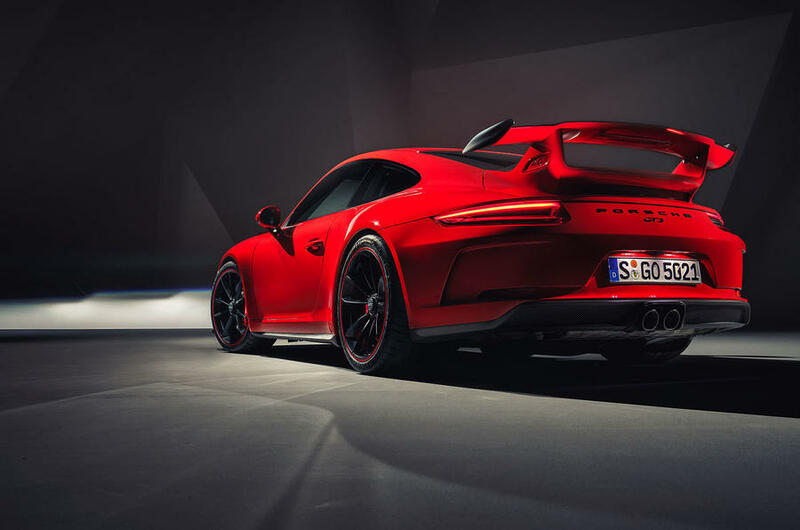 Porsche offers three additional seat variants for the 911 GT3: The adaptive Sports seats Plus boast electrical adjustment of all seat functions (18-way). 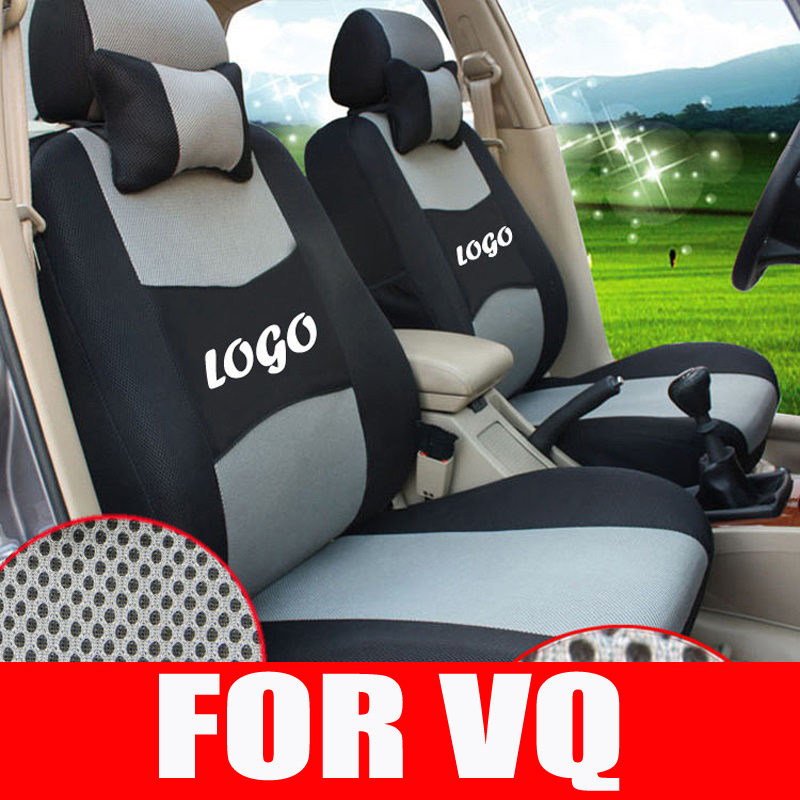 The second option is sports bucket seats with folding backrest, integrated thorax airbag and manual fore/aft adjustment. And the third variant is full bucket seats made from light carbon fibre-reinforced plastic in carbon-weave finish. 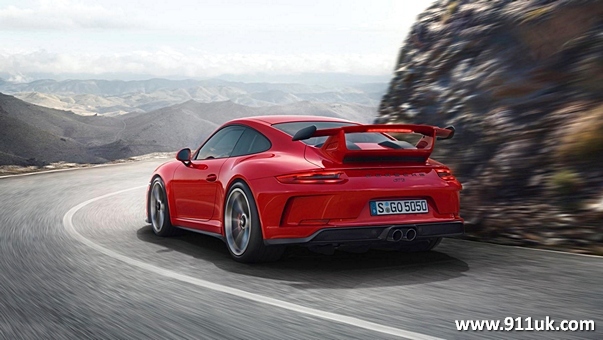 In addition to Porsche Communication Management (PCM) including an online navigation module with real-time traffic information, the standard equipment also includes the Connect Plus module and the Track Precision app. The Track Precision app enables 911 GT3 drivers to display, record and analyse detailed driving data on their smartphone. 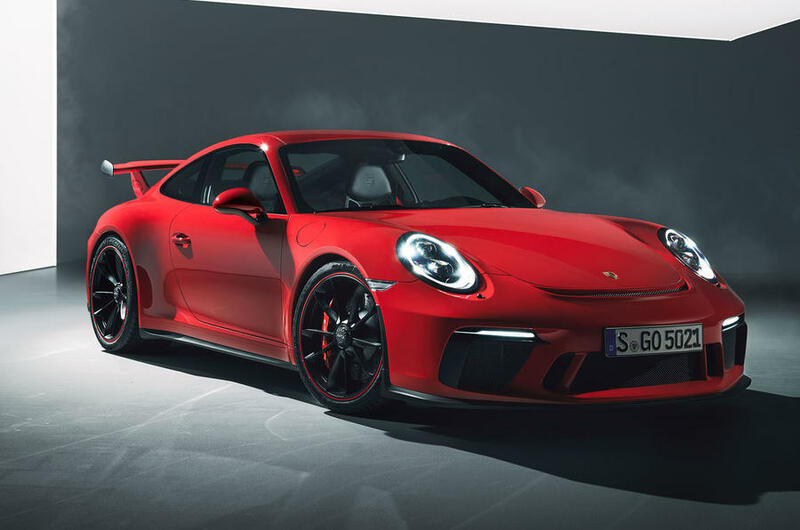 The revised Porsche 911 GT3 is regaining a manual gearbox option, following criticism that the current car has been offered only with a seven-speed PDK dual-clutch automatic gearbox since it was launched in 2013. 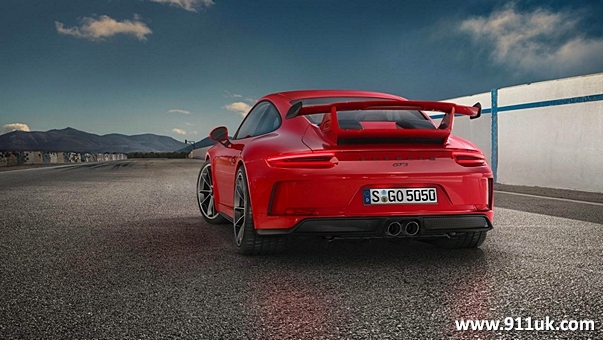 The revised GT3 uses a 493bhp 4.0-litre flat six, replacing the 469bhp 3.8-litre flat six. It is a development of the engine used in the 911 R and GT3 RS, with an upgraded valve train, a stiffer crank, low-friction cylinder liners, a new cylinder head design that dispenses with hydraulic valve adjusters and a 9000rpm redline - 750rpm more than the RS. The difference is “a quantum leap”, according to Porsche GT boss Andreas Preuninger. 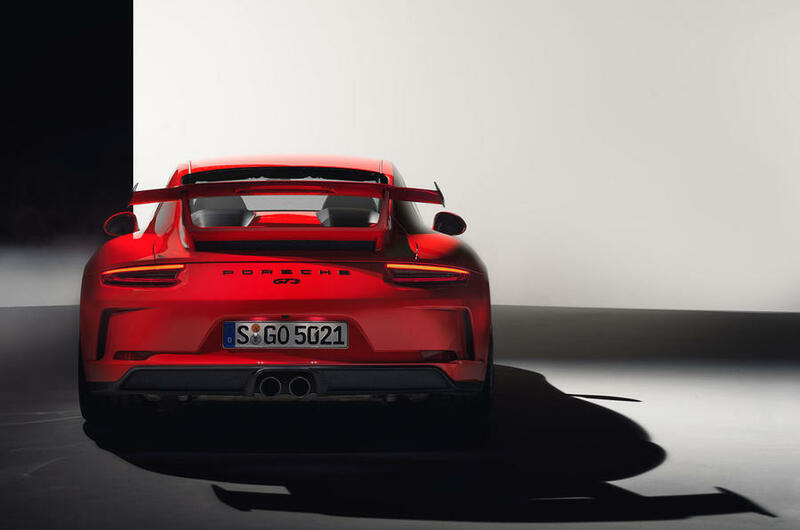 With the seven-speed PDK gearbox and launch control, the new GT3 will hit 62mph from rest in 3.4sec and reach 199mph. The six-speed manual version is slower off the line, at 3.9sec to 62mph, but can hit 200mph. Porsche has learned lessons from the 911 R that have helped to increase downforce on the new GT3 while reducing drag. An evolution of the R's underbody aero has been adapted for the GT3, while the fixed rear spoiler is mounted 20mm higher and 10mm further back to reduce drag and now works in partnership with the diffuser and underbody vortex generators. Preuninger claimed downforce at top speed is increased by 20% overall without any increase in drag - no mean feat, he said. The adjustable PASM dampers now have a wider operating range, bushings have been stiffened for greater steering precision and the rear struts now feature weight-saving 'helper' springs. As a result, Preuninger said the new car is both more comfortable on the road while even sharper on a circuit. This is important, because switching to the PDK ’box made the GT3 more attractive to a new range of customers who use their cars daily, not just as track day toys. 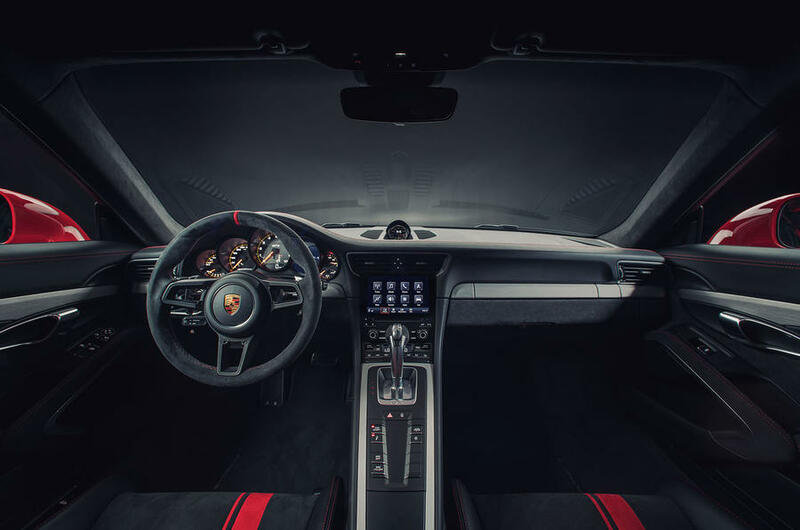 The interior gets the revised PCM infotainment system from the facelifted 911 range, complete with Connect Plus module and smartphone-ready Track Precision app to help you to analyse your circuit performance. There's also new scope to liven up the typically functional interior, including carbon-framed race seats and the option of a ‘3D’ colour-coded Alcantara stripe on the upholstery. Weight-saving measures include reduced soundproofing. Adding structural reinforcement to the body-in-white meant weight had to be shaved off elsewhere to maintain the 1430kg kerb weight of the first-generation car. The manual version is 10kg lighter still. 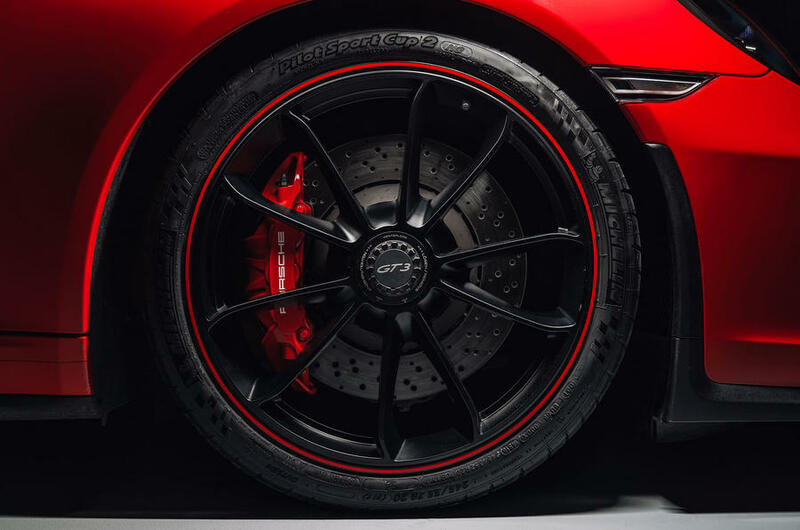 More weight loss can be achieved by opting for the PCCB carbon-ceramic brakes. "The new 911 GT3 is built in the same factory as our GT3 Cup Cars," said Porsche chairman Oliver Blume. "Sometimes in a sanitised age, it offers a driving experience that is different and true Porsche. 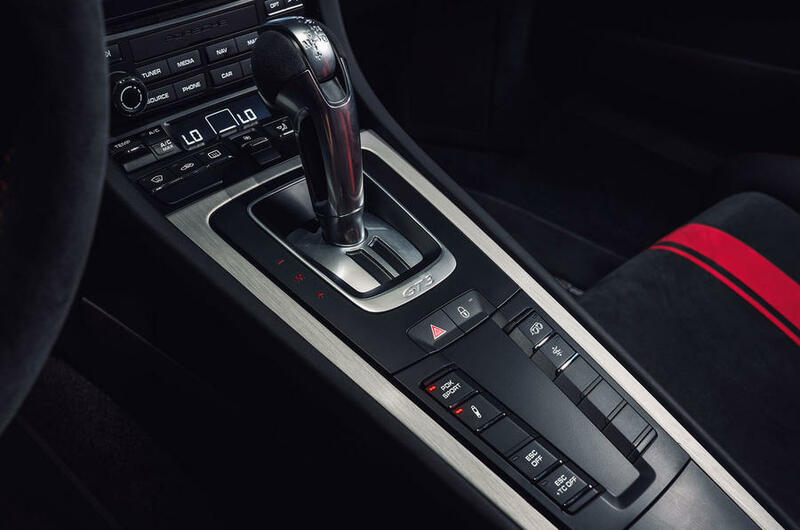 We have listened to our customers, which is why we will also offer the option of a six-speed manual, but the seven-speed PDK box is fitted as standard. "We will continue to offer the GT3 with a manual and which ever transmission you choose you are safe in the knowledge that you are getting a road going race car that feels alive." Pricing has not yet been announced, but Porsche expects demand to outstrip supply. The current GT3 RS costs £131,296. Hmm, that £500k 911R now not looking such a good bet IMHO. I guess a LWFW would be a potential mod. But nine thousand RPM... wow. Join the back of the queue behind all the speculatory car investment gits who will job them on for huge profits. Looks lovely. By the time I'm going to be in a position to do anything about it, I'll be on the end of a "sorry sir". Manual for me. Winning the 0-62 time isn't the end game. Telsa can do that for less fangolies and faster. The red thin trim on the wheels is an option as stated on the video. Not my cup of tea but what a car with the 4 litre, manual box and 9k rpm. Watch the 991.1 drop a bit in value? Not sure about the GT3 script on the seats?? Just out of curiosity, what was the reason stated that you won't be getting a shot?